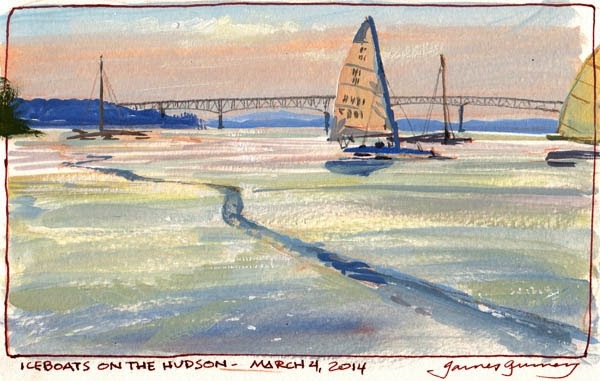 On Tuesday I set up my sketching stool in the middle of the Hudson River, a few hundred yards out from the shoreline. Beside me was a foot-wide crack. Every once in a while it groaned and creaked. When a tug passed by in the shipping lane, the crack let out a dull, low thud, which reverberated up and downstream. The sun was shining, but there was no wind. That was a good thing, because it meant that the iceboats would hold still while I painted them in gouache. 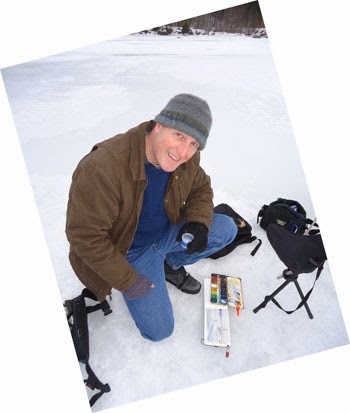 With the temperature hovering around ten degrees Fahrenheit, watercolors tend to freeze on the brush. I filled my water cup with vodka, which kept it flowing. That's the Plein Air spirit. Don't let a little cold weather stop you. 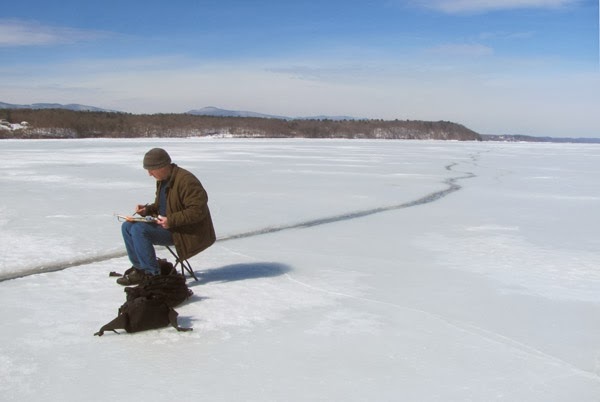 It's inspiring to see you sketching in all kinds of places and conditions. So Vodka can be used as a medium - good to know! On the opposite end of extremes, have you found ways to paint with water-based media when it's very hot? I imagine a wet palette of some kind might help. Are there some media better than others for painting in warm temperatures? NJL, it's not the heat, it's the humidity. Too dry or too moist is a problem. In dry conditions you can use a mist-sprayer and squeeze out the gouache on wet paper towels. In high humidity, you just have to be more patient. Any particular reason you opted for gouache over casein? Or was it just what you happened to reach for that day? Tom, it's just that I had gouache with me. Casein would have been fine, too. Love reading these little plein air adventures. OMG… I'm so glad that crack didn't expand and dump you in the river. Great post. Its very fine and wonderful post. Thanks for your nice post. Can you also use Vodka to speed the drying of gouache and watercolor when its cold and humid but not necessarily freezing? Thanks, I love your blog. Bennett, I don't know if vodka would speed the drying or not, but it's worth a try.